Winemaker David Potter at his Potek Winery in Santa Barbara. 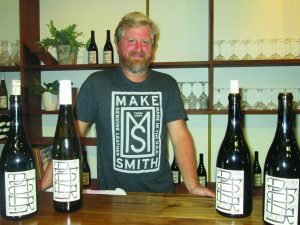 Synergy convinced David Potter to locate his second Santa Barbara wine venture at The Mill, a newly renovated 1904 building that has been converted into an artisan marketplace. Since 2007, Potter has owned Municipal Winemakers, whose no-frills tasting room in the city’s Funk Zone offers his everyday-priced wines. His new brand, named Potek after his great-grandfather, features “the best of the best that we can make,” Potter said at the new venue on the corner of Haley and Laguna streets. The winery and tasting room opened to the public Aug. 20. The winemaker had long been searching for an industrial space in Santa Barbara where he could move his production from a 1,700-square-foot plant in Buellton. He jumped at the chance to locate at The Mill because of the neighbors he will soon have there. Across from his indoor/outdoor space will be Third Window Brewing, a craft brewery and taproom headed by Kris Parker, grandson of the late Fess Parker. On another side of the courtyard will be Wildwood Kitchen, a barbecue restaurant from Justin West, well-known chef at Santa Barbara’s Julienne. Potter said he is confident that the combination will generate a lot of traffic. 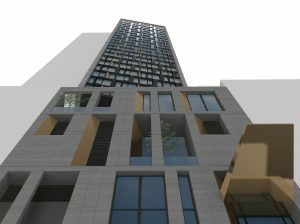 Visitors will be able to bring food from the restaurant to his courtyard tables and share carafes of wine. Inside, tasting bar patrons sitting near stacked barrels have a full view of the winery operation, which produces both the Potek and Municipal brands. Potter said he would have preferred to own his facility and build equity, but he weighed having to pay rent against the symbiosis he will enjoy with the adjoining tenants. Each of the five initial Potek releases of Riesling, grenache, syrah and two pinot noirs has an interesting story about the vineyard it came from. The 2013 Sanford & Benedict Vineyard pinot noir is from original 1971 plantings that were the genesis of the Sta. Rita Hills viticultural area. The full-bodied 2012 Tierra Alta syrah is from steep hillsides with chalky lime soil in northern Ballard Canyon. The 2013 Riesling is from Kick On Ranch in Los Alamos, which Potter believes is the top site in Santa Barbara County for the aromatic grape. “What we’re trying to do with this whole label is highlight the vineyard sources that we work with and try to bottle the wines as naked as we can,” Potter said. “The winemaking itself is very low input where half the time we’re not adding yeast, we’re not really touching the grapes.” Most of the wines are released without fining or filtering that would strip out some of the character. Each bottling is a small lot of 50 to 100 cases for a total of about 800 cases in the initial releases. Production for Municipal Winemakers is about 2,700 cases a year. That brand features blends and lesser known varietals like cinsault and counoise that are more commonly used in blending. “I think that makes them all the more fun to bottle,” Potter said. Potter earned a master’s degree in enology and viticulture at Curtin University in western Australia. He apprenticed in Australia for six years and later in France’s Rhone Valley. He was an assistant winemaker at Fess Parker Winery and started his own wine business in 2007. At Potek Winery, he wants visitors to hear stories behind his best wines. “There’s some stuff that’s just so special, it kind of sings to you in the cellar and we wanted to be able to pull that out and bottle it by itself,” Potter said.